Notch Neck Stripe Thermal Plus Size Tee is rated 4.7 out of 5 by 26. 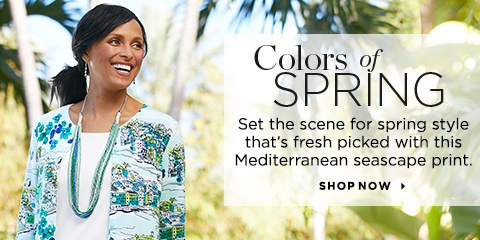 Stripes in a fresh hue breathe new life into this classic thermal tee. Rated 5 out of 5 by Ann B. from Love these Thermal Tees I ordered these Tees in green and purple. The colors are bright and pretty. They are not a heavy thermal, but they are good for wearing around the house or a trip to the store. I wore the purple to a Dr. appointment and got a compliment on it! It fits true to size and launders very well. I wish there were more colors, as I’d order them too. Rated 5 out of 5 by Effie23 from These are great shirts I bought these in both colors. They are so comfortable and feel so nice and soft. Rated 4 out of 5 by jvr123 from Comfy! This top is very comfortable to wear. Love the color. Looks great with jeans. Rated 5 out of 5 by ZenGarden1 from So Very Soft Do not be fooled by the word "thermal." This top is not your grandfather's thermal shirt. Rather, this top is baby soft with a bit of "give" so as not to cling. Best to wash on the delicate cycle with like fabrics as zippers and/or hooks, etc., could snag. Buy this and be completely happy! Enjoy! Rated 2 out of 5 by Essie B from Disappointed On the web page, it said to machine wash, but nothing about drying. The tag inside the shirt states: "machine wash and lay flat to dry; Do not tumble dry". I did not expect that I couldn't tumble dry a tee shirt. I decided to keep it, but I would not have purchased this item if I had known that. Rated 5 out of 5 by tallgirl24 from Love The Color Not your ordinary Tee! Just the right length and loved the color! Rated 5 out of 5 by Sanste from Fits so good!! I bought this shirt a couple of weeks ago. Was so cute I bought it in two colors! Already washed one and it came out looking like new. Sure looks cute with my dark wash jeans! Thinking of who I can gift one for Christmas!